Prime Minister Theresa May defended on Monday her decision to launch air strikes against Syria, answering criticism over her bypassing of parliament by saying lawmakers could now hold her to account. May, who has regained confidence after winning support for her tough stance on Syria and Russia, said she was driven by the need to decide quickly on joining the United States and France in Saturday's strikes, made in retaliation for a suspected gas attack. Saying she had no doubt the "Syrian regime" was behind an attack which she called a "stain on humanity", May told lawmakers she had acted in the national interest and refused to say whether she would seek their approval for further action. "I'm absolutely clear that it is parliament's responsibility to hold me to account for such decisions and parliament will do so," she told the House of Commons in a rowdy session that laid bare divisions over the military action. "But it is my responsibility as prime minister to make these decisions and I will make them." 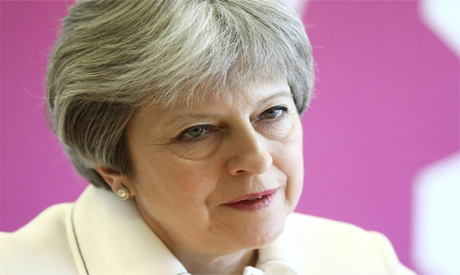 May has weathered months of doubt over her leadership due to rows over Brexit and an ill-judged decision to call an early election when her Conservative Party lost its parliamentary majority. She is now enjoying international support for her action in Syria and against Moscow over a nerve agent attack on a former Russian spy in Britain. Still, she has had to tread carefully in parliament, where she now relies on a small Northern Irish party to get enough votes to pass legislation, and has worked hard to offer lawmakers, angry about being sidelined, time to discuss the Syrian action. Ian Blackford, the leader of the opposition Scottish National Party in Westminster, was one of many who asked May why she had not recalled parliament for a vote, breaking with a convention dating back to the 2003 invasion of Iraq. "The prime minister leads a minority government," he said. "It was perfectly possible for the house to have been recalled in advance, why was this not done?" While some Conservatives also expressed their regret that she had bypassed parliament, May also enjoyed praise from others - one calling her a "real prime minister" by moving swiftly to support the joint air strikes. Instead, it was the opposition Labour leader Jeremy Corbyn who drew jeers and shouts when he suggested that May had simply followed the orders of U.S. President Donald Trump - something the British leader denied. "We have not done this because President Trump asked us to, we have done it because we believed it was the right thing to do, and we are not alone," May said to cheers. But she avoided answering questions on whether parliament would be consulted on any further strikes and ignored demands by Corbyn for a War Powers Act to limit the government's power to launch military action. Britain has said there are no plans for future strikes against Syria. Foreign minister Boris Johnson, in Luxembourg, again said the strikes were not aimed at regime change in Syria, but rather designed to send a message. May will be mindful of how military action can backfire. Former Prime Minister Tony Blair's legacy was tainted by his decision to join the war against Iraq, especially after an inquiry concluded that the decision was based on flawed intelligence, while her predecessor, David Cameron, was damaged after losing a vote for strikes against Syria in 2013. "She authorised military action with no mandate," said one Conservative lawmaker on condition of anonymity. "If it's a success, she wins. If not, she's the one that will take the blame."